Heat oven to 375°F. Line large cookie sheet with cooking parchment paper. Lightly press one stick into bottom side of each cookie. Place 2 inches apart on cookie sheet. Bake 8 to 10 minutes or until light golden brown and set. Let stand 3 minutes on cookie sheet; remove to cooling racks to cool completely, about 20 minutes. Using photo as a guide, decorate cookies as desired. Allow to set before serving, about 20 minutes. Colored sticks add to the playfulness, but plain ones also work. 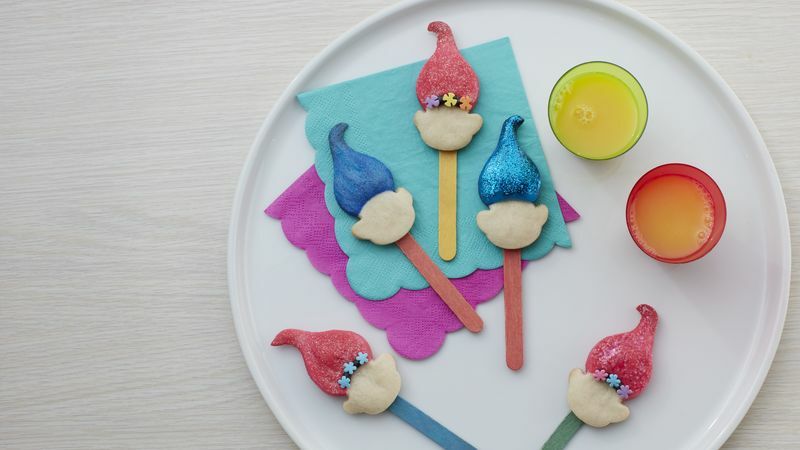 Get creative when decorating, and make an assortment of different hairstyle designs using multicolored icing, edible glitter and candy sprinkles. DreamWorks Trolls© 2016 DreamWorks Animation LLC. All Rights Reserved.